Passion for Fresh cooking class and tasting with Chef Ned Bell at Yew Seafood + Bar inside the Four Seasons Hotel Vancouver on October 3, 2013. 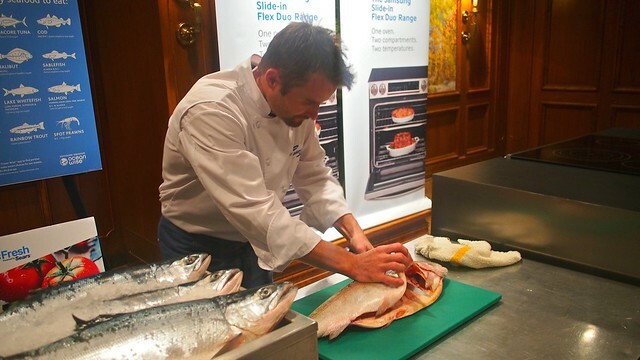 Samsung Canada invited us to private, interactive cooking experience led by Yew Executive Chef Ned Bell. The festivities were done in conjunction with Samsung's new Slide-in Flex Duo oven range touted by its dual temperature heating system. 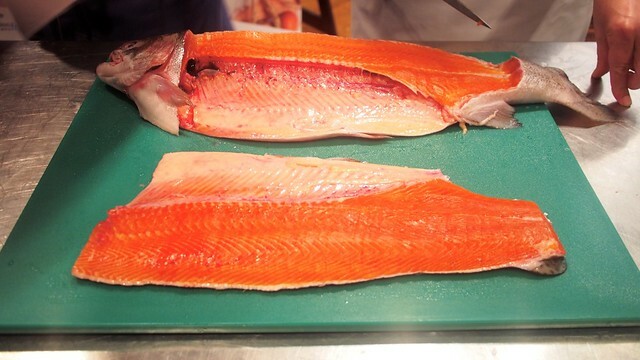 Bell took us to "cooking school" and taught us how to properly cut and prepare a fresh cut of fish (sockeye salmon and steelhead trout) before cooking it via pan and oven. Afterwards, we dined on some deliciously prepared Ocean Wise seafood. 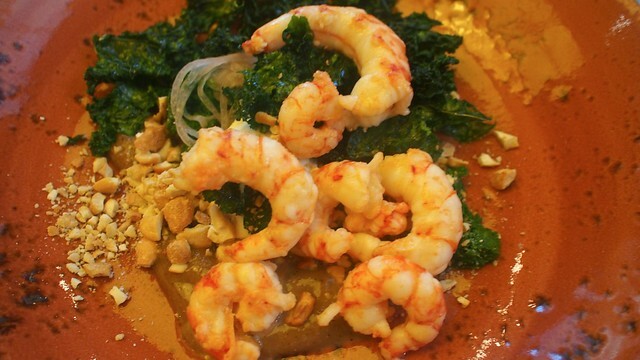 This organic ocean humpback shrimp salad (with kale pesto, kale chips, greek yogurt, almonds) was delightfully tasty and delectable. 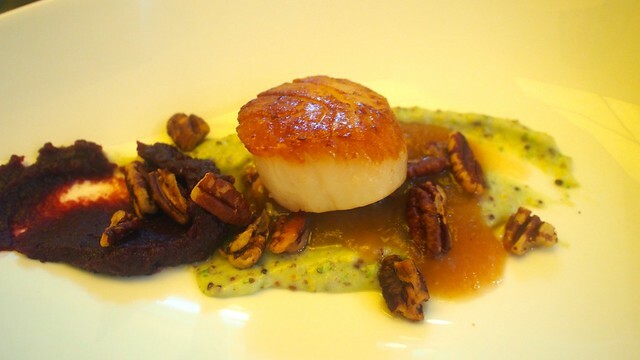 Bell treated us to a bonus scallop dish (with red cabbage foie gras and almonds) perfectly seared and prepared. 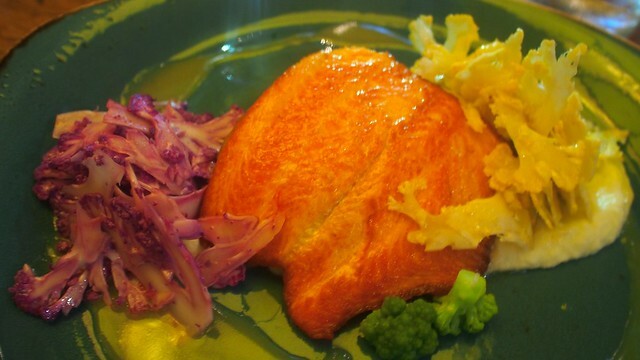 Keeping on theme, our entrée of oven roasted wild BC salmon (with cauliflower four ways, lemon dressing, and cashews) from the same cut we used in class was moist and flavourful. 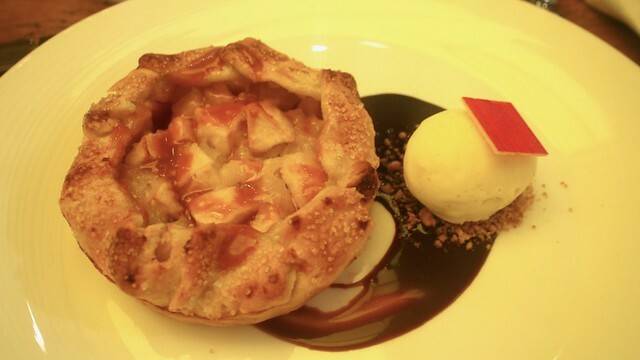 My highlight was the Okanagan apple tart (with honey and vanilla bean ice cream and salted caramel chocolate sauce) full of sweet goodness. 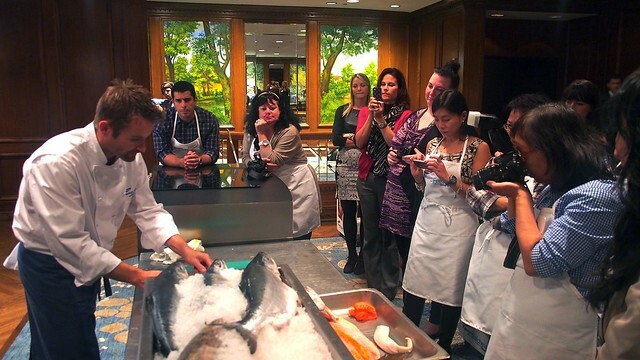 It was a intriguing, intimate experience learning about cooking, seafood, and dining.